Karina's Kreations: Pillow Box Die! This is a fun little box we made at my Tuesday class. It uses the Big Shot Die cut machine and the Pillow Box Bigz die. The box was cut out of Orchid Opulence card stock. A strip of Cottage Wall Designer Series Paper was added to the box. 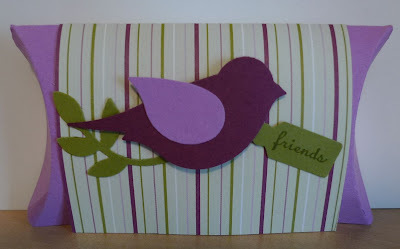 The bird was made with the Extra Large Two Step Bird Punch and Old Olive, Orchid Opulence and Rich Razzleberry card stock. The greeting is from the Tiny Tags stamp set and was punched out with the Medium Jewelry Tag punch. The box fits two chocolates.